I’m so excited to be sharing these photos although I’ve been procrastinating for the last couple of days, trying to narrow down my favourites and wanting to find the words to do justice to this incredible wedding. If I live to be 100 it will still be in my Top 10 Life Experiences. And in fact, that is just what Frances and David created for their guests - it wasn’t simply a wedding, it was an amazing experience that everyone who was there will always remember, and recall how they felt being a part of it. You may recognise David and Frances from ABC TV’s Australian Story. They have Wooleen Station, a half a million acres pretty much in the middle of nowhere in Western Australia, which they have destocked and revegetated over the last 8 or so years. They are also two of the most beautiful humans you could wish to meet. Combining my passions of photographing stories, epic road trips and remote camping, this one was always going to be special, but four days in the outback with a whole bunch of lovely people, and “special” doesn’t begin to cover it. It really was all about the people, not only Frances and David, but all their family and friends who had gone to such an effort to get there. It was the connections and friendships - both those we witnessed, and those we made. It was the stories - over the four days and nights, layer upon layer was added or revealed. And it was so much more besides...the awe-inspiring landscapes - the lakes filled with fresh water after the recent rains, the ancient rock formations and the breakaways, and the enormous outback skies, It was the Murchison River winding through the land. It was the old homestead and station-buildings, the camping and the glamping, the barbecues and pop-up restaurants. It was the mud maps and the bush mechanics. The clouds of dust rising in the distance as vehicles travelled around the station, and the vintage cars that added a touch of surrealism as they drove across the scene. It was watching the setting sun as David’s father Brett shared his knowledge and stories and then, moments later, turning to see the full moon rising on the opposite horizon, reflecting in the lake and taking our breath away. It was the dragonflies galore and the frogs in the loos. It was toasting David and Frances, their commitment to each other and to the land. It was dancing as though no one was watching, beneath the stars and the moon in the most magical of settings. We were there as a community, sharing this place and this experience, celebrating Love, and for a few days we were self-contained - nothing else mattered. 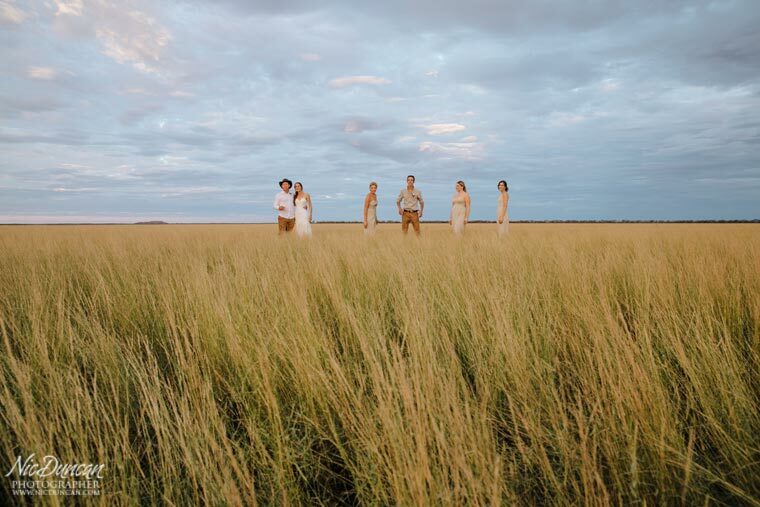 You can catch-up on all that David and Frances are achieving at Wooleen (plus a few of my wedding photos) on Australian Story on Monday 8 May on ABC TV at 8pm (or on iView). You can also experience Wooleen Station for yourself with all sorts of accommodation and eco-tourism options available. Check out their website and find them on social media. Flowers from Rustic Posy beautifully arranged by Frances’ Mum Bernadine.